Home Posts tagged "everything is connected"
Meditating on the idea of peace, and I was reminded that it comes when everyone remembers their connection to each other. It is recognizing “The Source”, or God, in each living thing (including other species, plants, the ocean, the earth…). 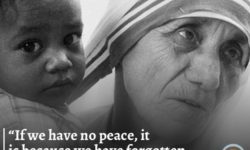 Mother Teresa understood it.